Based on a recent report from Cisco Systems, it is anticipated there will be more than 15 billion network connections by 2015, driving continued demand for faster speeds, greater bandwidth, and optimal applications. With this change in network demand and requirements, equipment architecture trends have also changed. With the emergence of virtualization, cloud computing, and lower latency requirements, the Telecommunications Industry Association (TIA) published addendums (ANSI/TIA-942-A-1) in March of 2013, specifying recommendations for telecommunications cabling to support new switch fabrics. The traditional 3-tier architecture, designed to support data centers over the past five years, is no longer the most ideal solution for meeting network growth. 3-tier architecture comes with a number of disadvantages, including higher latency and higher energy requirements. New solutions are being introduced to optimize performance. Fat-tree architecture, also called leaf-spine architecture, is one of the emerging switch architectures that are quickly replacing traditional solutions. Fat-tree architecture features multiple connections between interconnection switches (spine switches) and access switches (leaf switches) to support high-performance computer clustering. In addition to flattening and scaling out Layer 2 networks at the edge, fat-tree architecture also creates a non-blocking, low-latency fabric. This type of switch architecture is typically implemented in large data centers. 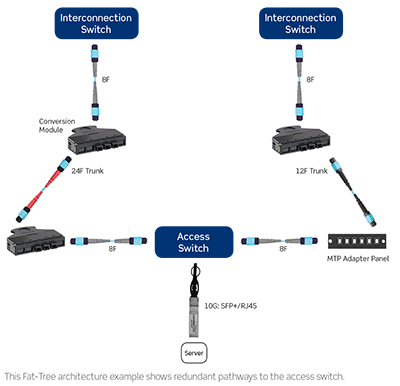 In the fat-tree example below, the interconnection switch is connected directly to the access switch through the use of 12- or 24-fiber MTP® Trunks with either a conversion module (24-fiber) or MTP® adapter panel (12-fiber). Compared to traditional 3-tier architecture, you can see that fat-tree architecture uses fewer aggregation switches and redundant paths to support 40GBASE-SR between the access and interconnection switches, thus reducing latency and energy requirements. Full-mesh, interconnected-mesh, centralized, and virtual-switch are additional examples of emerging architectures included in the ANSI/TIA-942-A-1 published standard. Like fat-tree architecture, these new switch fabric architectures provide lower latency, higher bandwidth, and include non-blocking ports between any two points in a data center. Full-mesh architecture dictates all switches be connected to every other switch. As switches are not typically in an equipment distribution area (EDA) and fabric is not used for top-of-rack (TOR) topology, full-mesh architecture is often used in small data centers and metropolitan networks. Interconnected-mesh architecture, similar to full-mesh architecture, is highly scalable, making it less costly and easy to build as a company grows. Interconnected-mesh architecture typically maintains one to three interconnection switches (HDAs or EDAs), and is non-blocking within each full-mesh POD. In centralized architecture, the server is connected to all fabric switches, utilizing simple and low latency. Often managed by a single server, centralized architecture is easy to maintain with a small staff. However, port limitations can prohibit this type of architecture from scaling well. As such, like full-mesh architecture, centralized architecture is typically used in small data centers. Virtual-switch architecture, though similar to centralized architecture, uses interconnected switches to form a single virtual switch. Each server is connected to multiple switches for redundancy, leading to a potentially higher latency. One down side to virtual-switch architecture is that it does not scale well unless fat-tree or full-mesh architecture is implemented between virtual switches. With the emergence of new switch architectures comes a greater demand for flexibility in design along with the need for optimal scalability. Pre-terminated 12- or 24-fiber MPO/MTP® cabling is ideal for supporting higher bandwidth requirements in data centers using these architectures. It ensures cabling design maximizes fiber utilization throughout the infrastructure. It also promotes an easy migration path to support current or future IEEE 40G and 100G bandwidth as required by ANSI/TIA-942-A-1 standards. New, lower-cost transceiver technology has also recently been developed to work in tandem with pre-terminated 12- or 24-fiber MPO/MTP® cabling to support higher levels of performance and accommodate data center links over 150 meters. For example, new extended-reach QSFP+ transceivers can support 40GBASE-SR4 beyond 150 meters. These multimode transceivers can transmit longer distances using the same cable: up to 300 meters over OM3 and 400 meters over OM4. Using pre-terminated MTP® cabling and connectivity, Leviton performed active testing at customer data centers with Cisco and Arista switches that include these transceivers, and confirmed that 10G and 40G channels both worked at stated distances with zero errors and no lost data packets. To support new architectures, IEEE is working on new physical layer requirements. The IEEE P802.3bm task force is developing standards to support next generation 40/100GbE technologies that lower costs, reduce power consumption, and increase density. In addition, the IEEE 802.3 400G Study Group, formed in March 2013, established initial objectives for 400G using OM3 or OM4 fiber, and utilizing 25G per channel, similar to proposed P802.3bm standards. These new standards developments are needed to support higher network uplink speeds. Therefore, designs should be flexible to accommodate the need for scalability. It is critical to understand the impact of these new architectures and standards on your data center and prepare a migration strategy for moving to 40G, 100G, and beyond. It is also important, when upgrading a network, to acquire assistance from experts who understand the evolution of the data center environment and fabric design architecture. Leviton works closely with many leading equipment manufacturers, is active in all next-generation standard developments, and can advise customers on their best possible migration strategy. For more information or assistance with designing your next data center topology, contact Leviton's data center and specifications team at dcteam@leviton.com.